Aresa Erkocaj, 16 , from Shkoder Student at High School "Pjetër Meshkalla" She has participated in the creation of animated film "Lumi", in 2017. Aresa has participated in community service activities at the "Preschool Children's Home", various activities organized by the school "Pjetër Meshkalla" and a summer camp in Cetinje in Montenegro during July 2013. 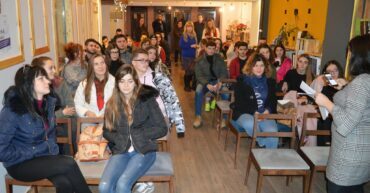 Sabina Babameto, 23, from Shkoder Achieved a Master of Science in Law at the University of Rome She participate in various trainings, debate competitions, and engaged in activities related to environmental issues. Sabina thinks that youth needs greater employment opportunities, qualitative training courses, space to develop professional skills, and opportunities that involve youth in decision-making.